Get lost in NYC with Turkish baths, Indian delicacies, and Chinese bodywork. When my fellow Lost Girls and I traveled the world in our twenties with nothing but a pack on our backs, I fell in love with the open road and daydreamed about living the vagabond lifestyle forever. Nearly a decade later with two little ones in tow, the reality is that I'm more likely to stick to US destinations or opt for a staycation. Living near New York City lets me feel like I'm visiting some of my favorite countries (which include Turkey, India, and China) without having to hop on a plane. Here are three secret gems in the Big Apple that help satisfy my wanderlust while being close to home. The chic-but-cozy lobby of the newly-opened, centrally-located Marmara Park Avenue features lots of rounded white marble. This element gives it a distinctly Turkish feel for me, though the hand-blown glass and faceted steel in the vestibule and most other materials are locally sourced from the five boroughs. But I was really transported back to Turkey when I visited their Wellness Center that's home to one of the few authentic hammams in the city. 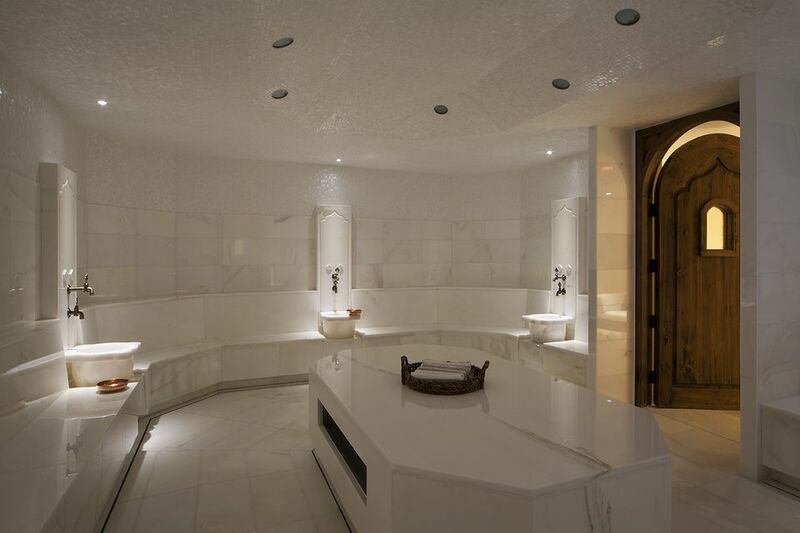 The therapist Savas grew up going to these Turkish baths, and expertly exfoliates and cleanses your skin while you lay on heated Turkish marble stone in the steam room to aid the detoxification process. Be sure to bring your bathing suit because the treatment involves pouring buckets of hot water and suds over you from head to toe. Savas says one reason you feel so good after a traditional hammam treatment is that the heat helps purify your body of toxins. The whole experience definitely made me feel lighter, and like I had been transported back to Turkey. When in India I got a taste for a savory street snack called bhel (usually made with puffed rice, veggies, and tamarind sauce). New York City has no shortage of Indian restaurants, but the best I've eaten at so far is called Utsav, a Sanskrit word meaning 'festival,' in the Theater District. Though it's been around for years, it recently got an updated look, menu, and wine list. It can be a bit hard to find—it's located on a skywalk connected by two Midtown buildings at 1185 Sixth Avenue, but the entrance is actually on 46th Street between Sixth and Seventh Avenues—but is worth the search for its innovative and fresh food (fresh is not a word I would normally use to describe Indian restaurants in New York!). Well-known Indian chef Hari Nayak gives some standard Indian dishes an interesting twist, such as adding corn, mango, and peanuts to the traditional bhel; edamame to a samosa; or quinoa to aloo tikki. If you like it spicy, try the Chilli Cornish Hen (it has chipotle!) or the Chicken Chettinaad. Wash it down with a creative cocktail such as the Bengal Tiger (made with brandy, dark rum, triple sec, pineapple and cardamom reduction topped with club soda). The menu shines most at dinner, but there's also a lunch buffet seven days a week for $20.95, and happy hour specials with $10 Indian bar food (think: Bollywood chicken tacos). One of the things that surprised me when visiting China was how getting regular massages and bodywork seemed to be part of a culture of staying well (as opposed to the American tendency to wait until you are sick or injured to visit a specialist for treatment). So I've been visiting Organic Mama Spa for years after returning from my trip. It's a simple little health spa designed with the principles of Feng Shui in mind (treatment rooms are each assigned an element such as wood, metal, water, earth, or fire) and located in the Lower East Side's Allen Street. But it's like a relaxing retreat amid a buzzing city, offering bodywork utilizing Traditional Chinese Medicine techniques and skincare made with organic and herbal ingredients. Their prices are pretty affordable compared to come other spas in the city (you can get a 60-minute massage for $70 but they offer deep discounts if you buy packages).